Protesters of Olympics host China demonstrate as the Olympic torch passes through San Francisco. WASHINGTON (JTA) -- A large group of rabbis spanning Judaism's religious movements says it has an answer to the vexing question of how to send China an Olympic-sized message without harming the interests of athletes or Israel. In an appeal issued Wednesday and timed for this week's commemoration of Yom Hashoah, 185 Jewish leaders -- mostly clergy -- appealed to Jews not to attend the Beijing Olympics this summer as tourists. The next day, the Anti-Defamation League rejected the boycott call and said comparisons the clergy statement made to the 1936 Berlin Olympics were inappropriate. Three Orthodox groups -- the Orthodox Union, Agudath Israel of America and the National Council of Young Israel -- also in recent days have rejected the boycott idea. China is the principal power propping up the regime in Sudan, where government-allied militias have murdered hundreds of thousands of civilians in the civil war in the Darfur region. It is also cracking down harshly on independence movements in Tibet. Jewish groups have played a disproportionate and lead role in drawing Western attention to the Darfur killings. Yet deciding whether to confront China, which enjoys thriving trade with Israel, presents a more complicated set of issues than attempting to isolate Sudan, a poor country that does not want relations with the Jewish state. Also complicating matters is that the United States and Israel have recently scored modest successes in getting China to join the effort to isolate Iran until it ends its suspected nuclear weapons program. The appeal is cast narrowly, organizers said, as a way around such dilemmas that other groups and nations have faced in determining how to confront the Chinese over human rights abuses while not harming athletes and national interests. "There's a difference between doing business, which is a necessity, and spending discretionary income on sports, which gives a country legitimacy that's doing a number of very bad things that Jews should be sensitive to," said Rabbi Haskel Lookstein, the head of Manhattan's Kehilath Jeshurun synagogue, who was a coordinator of the statement. Lookstein and another Orthodox organizer of the petition, Rabbi Irving "Yitz" Greenberg, the former chairman of the U.S. Holocaust Memorial Museum Council, saw an opportunity when they learned that China was preparing a kosher kitchen for the Olympics. The outreach to Jewish religious needs struck a chord. "Beijing's authorization of the creation of a kosher kitchen at the Olympics village is apparently intended to help attract Jewish tourists to the games, as part of its broader strategy of improving its image and deflecting attention from its complicity in severe human rights abuses at home and abroad," the statement said. "Jews should not be party to the whitewashing of such a regime, kosher kitchen or no kosher kitchen. Regimes that practice or enable oppression, terrorism or genocide are not kosher." The Wyman Institute for Holocaust Studies, which took part in preparing the statement, noted that Germany used the 1936 Olympics to help create the false impression of secure Jewish communities and thereby diminish American awareness of the impending Nazi threat. "Having endured the bitter experience of abandonment by our presumed allies during the Holocaust, we feel a particular obligation to speak out against injustice and persecution today," the statement said. "We remember all too well that the road to Nazi genocide began in the 1930s with Hitler’s efforts to improve the public image of his evil regime. Nazi Germany sought to attract visitors to the 1936 Olympics in order to distract attention from its persecution of the Jews. "Hitler's propaganda minister, Joseph Goebbels, called the 1936 Games 'a victory for the German cause.' We dare not permit today’s totalitarian regimes to achieve such victories." The ADL statement rejected such parallels. "We believe that these comparisons are inappropriate," its statement said. "China is a complicated society that is changing and opening up in many ways, and one simply cannot equate the Beijing Olympics with those games in Nazi Germany on the eve of the Holocaust." Greenberg said the offensive aspect of preparing the kosher kitchen was in using the appeal as a means to subvert opposition to China's human rights abuses. "They're trying to use providing kosher food as a way of building up the Olympics," he said. Rabbi Eric Yoffie, the president of the Union for Reform Judaism, said the rabbis' statement is "an appeal to individuals, not an appeal to the government of Israel." Yoffie noted that Israel is a small nation that has had to balance geopolitical realities with compelling moral matters. "This is a moral appeal to Jewish individuals around the world," he said. Greenberg said individuals were less susceptible to the pressures of maintaining alliances and promoting trade. "There are counterforces for countries and organizations, but not for laypeople," he said. Organizers said they also did not want to harm athletes. The wholesale U.S.-led boycott of the 1980 Moscow Olympics is now considered a failure that hampered athletic careers more than it moved the Soviet Union to change its Afghanistan policies. Appealing to rabbis to sign as individuals circumvented the difficult questions that would arise if Jewish organizations were involved. The organizers did not approach Jewish groups, although they hoped that some would sign on. The American Jewish Congress has signed. 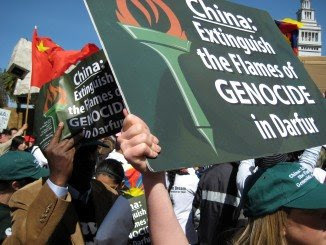 The ADL in rejecting the boycott call said, "While there is no doubt that China has an extremely poor human rights record and that its actions in Tibet and Sudan are to be condemned, we believe that asking the Jewish community to engage in a boycott of the games could be counterproductive and would not produce any tangible result." Greenberg and Lookstein lined up other Orthodox notables to sign on, including Rabbi Norman Lamm, the chancellor of Yeshiva University; Rabbi Dov Linzer, the dean of Yeshivat Chovevei Torah, a rabbinical school in New York City, and David Bernstein, the dean of the Pardes Institute for Jewish Studies in Israel. They were joined by the leaders of the Reform, Conservative and Reconstructionist movements, as well as dozens of rabbis across the United States and Canada. The three Orthodox groups saw the matter differently. In its statement, the Young Israel said, "The Olympics is intended to be a unifying international event where nations from throughout the world come together for a common purpose. While we certainly share concerns about the host country's position on human rights, we believe that boycotting an event which is intended to promote peace and harmony is extremely counterproductive. We also believe that drawing a comparison between the 1936 Olympics in Germany and the 2008 Olympics in China is inappropriate." The Orthodox Union noted that "Jewish law cautions that we must act with exceptional care lest we cause more harm than good. The leadership of the Orthodox Union believes such exceptional care is demanded in these circumstances with regard to relations with the Chinese government." Agudath Israel of America said it understood the motivation behind the effort. "We too are deeply concerned about reports of human rights violations in China," the fervently Orthodox umbrella group said. "We believe, however, that it is presumptuous, and perhaps even counterproductive, for a group of private citizens to urge a boycott of the Beijing Olympics -- and to direct their appeal specifically at members of the Jewish community." At least three Jewish groups last month called on President Bush to boycott the opening ceremonies as a high-profile step that would not harm athletes. Offering that viewpoint were the Reform movement; the Jewish Council for Public Affairs, an advocacy umbrella organization bringing together national groups and local communities; and the American Jewish World Service, the lead Jewish group in the efforts to stop the violence in Darfur. Bush spokesmen say he plans to attend, although they emphatically do not rule out a change of heart. Hadar Susskind, the JCPA's Washington director, welcomed the rabbis' statement but wondered about its effectiveness. "I don’t know how useful that is as a real lever to get China to change its practices," he said. Rabbi Joel Meyers, the executive vice president of the Conservative movement's Rabbinical Assembly, said he hoped the call would resonate beyond Jewish tourists but doubted it would.